The turnaround plan proposed by the SBI-led lenders’ consortium will involve a change in its existing management. Lenders consortium led by State Bank of India (SBI) showed confidence in solving Jet Airways crisis by March end, media reports suggested. SBI chairman Rajnish Kumar said that lenders would make every effort to keep the airline from slipping into bankruptcy as it would further erode the company’s value, media reports said on Wednesday evening. The turnaround plan proposed by the SBI-led lenders’ consortium will involve a change in its existing management, reports added. Accordingly, the bank has asked Goyal, his wife Anita, and two nominee directors, Nasim Zaidi and Gaurang Shetty, to step down from the board as well as executive roles. 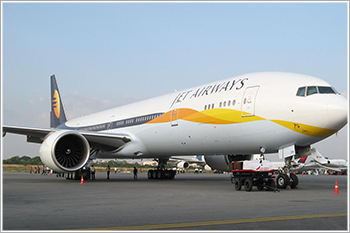 On Wednesday, Jet Airways (India) Ltd's share price ended at Rs218, down by Rs11.05 or 4.82%, from its previous close of Rs229.05 on the BSE. The scrip opened at Rs215.70 and touched a high and low of Rs224 and Rs213.95, respectively. A total of 1,45,35,122 (NSE+BSE) shares have traded on the counter. The current market cap of the company is Rs2,476.48cr.